A brilliantly original assessment of what caused the global crash-and a practical plan for investing accordingly Supercycles, according to international economist and strategist, Arun Motianey, are the continuous, long waves of boom and bust that undulate through the global economic and financial systems. More often than not, they are the result of policymakers' well-intentioned but misguided attempts to achieve price stability. 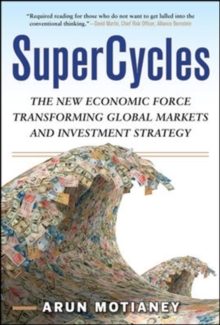 In Supercycles, Motianey surpasses the traditional business cycle model ("Boom and Bust"), to provide a detailed, objective, and at times surprising explanation of global economics. Drawing heavily on history and informed by cautious readings of a wide range of economic thought, Motianey critiques the way macroeconomics has been practiced by the major powers' central banks through the years.Specifically, it was the banks' intervention, ostensibly in the quest for price stability that actually served to entrench price instability. Further, he makes a compelling case for the new tools we'll be using to manage the post-meltdown global economy, and even advises on investor portfolios to protect us from the likeliest scenarios that occur when a supercycle enters its terminal phase. A cogent and impossible-to-ignore mixture of economics, finance, policy, risk management, and investment advice from a global perspective, Supercycles is certain to inform and inspire debate among investors, academics, and casual readers alike.Reviews: "Motianey is an engaging writer and Supercycles should be considered a must read for economic junkies. His ideas are fresh and innovative and he attempts to avoid the dogma that frequently leads those in the profession astray. I highly recommend it for those who want to gain greater perspective on the Credit Crisis and where we might be heading in its aftermath. --SeekingAlpha.com"Highly readable. The pitch-perfect blend of the best economic thinking informed by the lessons from the past and the investment savvy of a veteran investment advisor at the top of his game." -- Thomas J.
Trebat, Executive Director, Institute of Latin American Studies & Center for Brazilian Studies, Columbia University"A provocative way of looking at the global economy.This book will make you stop and think." -- Peter Scaturro, Private Bank Executive"This lively volume not only examines the big picture, but also provides practical advice for investors who are trying to prosper in this complex and challenging economic environment." -- Harvey S.
Rosen, John L. Weinberg Professor of Economics and Business Policy, Princeton University"Arun Motianey sheds light on some of the more ludicrous propositions of modern equilibrium economics. He describes how investment bankers and economists got itall wrong-and the world is experiencing the disastrous consequences." -- Dr. Terry O'Shaughnessy, Fellow in Economics, St. Anne's College, Oxford University"Not all readers will agree with Motianey's savage criticism of the finance-driven modern economy, but few can read SuperCycles without having at least some of theirpreconceived notions challenged.